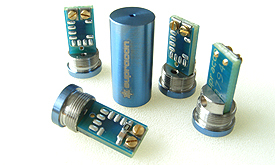 Supracon current sensors were designed for a simple customer-specific setup of niobium wire - wound magnetometers, gradiometers, and for preamplifiers of current or voltage signals with small amplitudes. The sensors can optionally be equipped by a superconductive shielding. The installation of the SQUIDs is very simple because of the lack of any cooled matching circuitry in combination with the JESSY SQUID Electronics. Our selection of standard models was developed and adapted for a variety of different measuring tasks. Please consult the following table for an overview on the according parameters to find the most suitable sensor for your purposes.